RIM has confirmed that it will finally unleash a long-promised software update for the suffering BlackBerry PlayBook next week at CES 2012. The BlackBerry PlayBook OS 2.0 will likely bring the elusive Android app player which will allow some Android applications to run on the device. Also expected is a native email client and a host of other improvements aimed at making the device, which is currently available for as little as £169, more user-friendly. RIM was criticised heavily for not delivering on these promises in 2011 and delaying the software update until the new year. The new software will be unveiled at an 'intimate event; next Tuesday 10 January in Las Vegas. However, the invite to the press offers no insight into when the platform may be available to the long-suffering PlayBook owners. Meanwhile, Pocket-Lint says it has confirmation from RIM that the crucial BB10 smartphone platform will be officially unveiled at the Mobile World Congress event in Barcelona next month. 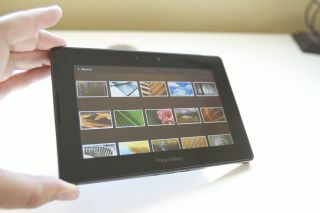 More reports on Thursday claimed that RIM has ditched other BB10 projects to focus on just one flagship device, which is seen as critical to any comeback the company can make in 2012. We hope for RIM's sake that the PlayBook 2.0 OS and BB10 can deliver, or 2012 is likely to be much like 2011 for the Canadian giant.